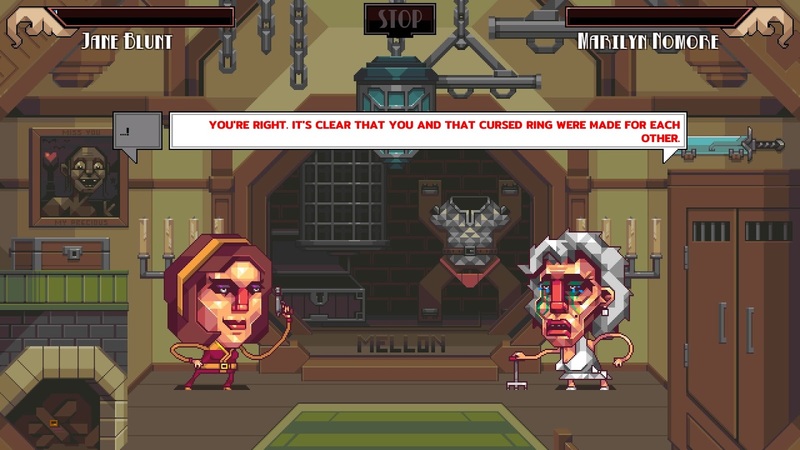 When I first applied for a code for this game I thought it looked right up my street due to the naughty insults and funny characters and later on came to learn that it was actually a sequel to Oh...Sir! 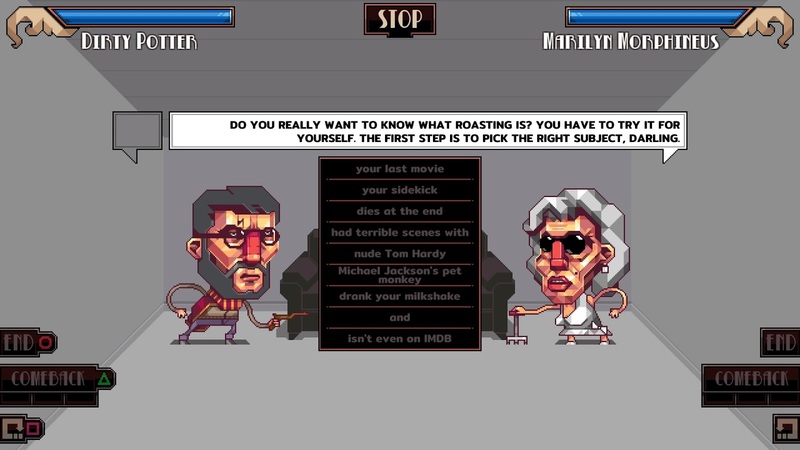 The Insult Simulator which I had never played or heard of before so this kind of game was new to me. The artwork is strange but hilarious as are the names of some characters are very clever each character is actually a caricature which is usually very amusing, the characters are based on real-life celebrities with their names changed to ridiculous things such as Harry Potter is Dirty Potter and The Greasy Wizard. The rules of the game are pretty simple, you have to insult one another with the lines that you are given on screen but they need to work well together and make sense, the game is sure to let you know that the sentence doesn't work and you need to work on your grammar, which I guess can help people improve on their own even if a lot of what is said is crude and sometimes doesn't make any sense, at times I found it a little tedious as you could run out of insults to say very quickly and what was left didn't make an ounce of sense but this used to help me by learning how to choose the order of my insults even if the other player chooses the one I wanted to use. There are different modes you can play I would suggest starting out with acting classes to get the feel of the game and then moving on to single scenes after I did both of those modes I tried my luck at the career mode. In career mode, there are a set 3 things listed in which you need to complete at least one of these in order to move on to the next opponent and step of your career so you will find yourself playing against the same character until you have ticked off all of the boxes for these achievements. By using longer sentences you will be able to get more points for your insults, especially by using a comeback which usually never makes any sense but it helps push your points up, each opponent has a weakness and it's your job to remember what this weakness is. Once you have completed your career for a character you will be able to unlock more characters and insults within the game there are 8 characters to play as in total. Although a lot of the time the insults come across as ridiculous they do make you chuckle a bit, the use of your mum jokes are used a lot in the game and most insults start off with you saying "your" followed by an ex or your dog etc which reminds me of petty insults people used to use in school. At times I found that some of the battles would drag on and the insults would start becoming repetitive, I was terrible at this game as the insults I would use wouldn't do as much damage as I thought they would have. I can see a lot of bored teenagers playing this with one another using Roast on a Coach mode, it also has Roast on the Internet mode which enables you to cross play with others who are online, I did try this mode but no one was online to connect with but seeing as I was terrible at the game and knew I would lose against a stranger online so maybe it's a good thing I couldn't find any players. The sudden death mode was a cool feature, if you and your opponent both defeat each other at the end of the last round it goes to sudden death, I liked that you could bring someone's health bar done with the hit of one insult, it would have been nice if they changed up the insults and gave you a choice of hasher insults in this round though. 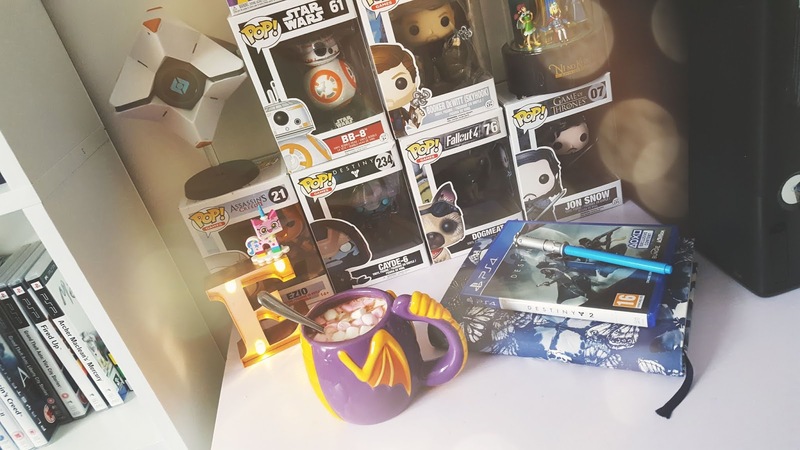 The voices felt very robotic at times which made the game feel a little bit boring as I would have loved a bit more emotion and maybe some laughter to go with the game, as a whole it's a nice little time waster, I will probably carry on playing it to try and get all the trophies at some stage because they seem pretty doable or have a games night with James and see if he can do any better at the insults than I can. 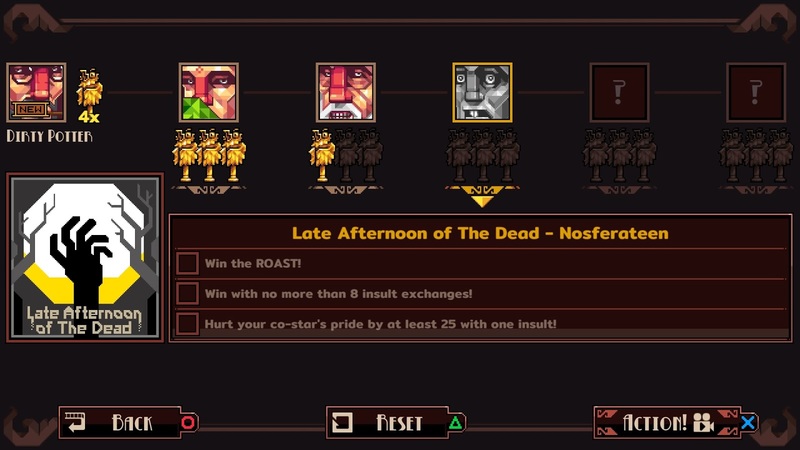 This game is meant to be offensive with both words and the stereotypes of the characters, but I felt it was capable of being so much more than it is which is a little bit disappointing as I was looking forward to playing a game that would make me laugh loads. 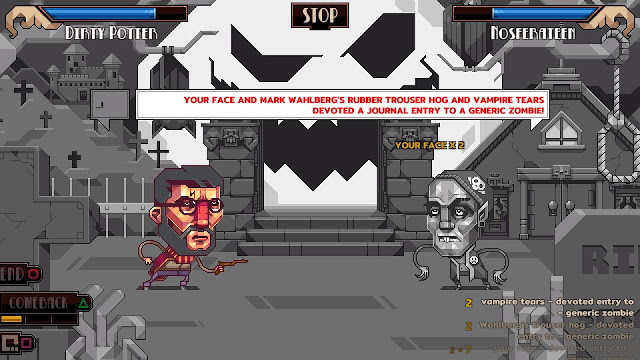 I wasn't keen on them naming one of their characters Chop Sue E who is an Asain actor in the game, I found it to be in bad taste and think they used it just for a cheap laugh. There is a lot I disliked about this game mostly it didn't keep my attention and felt like the jokes were very flat, the game is only £3.99 in the PlayStation so you get what you paid for really, I'm going to give this a 2/5, maybe if it was less repetitive with the insults I would have scored it a little higher. Oh...Sir! 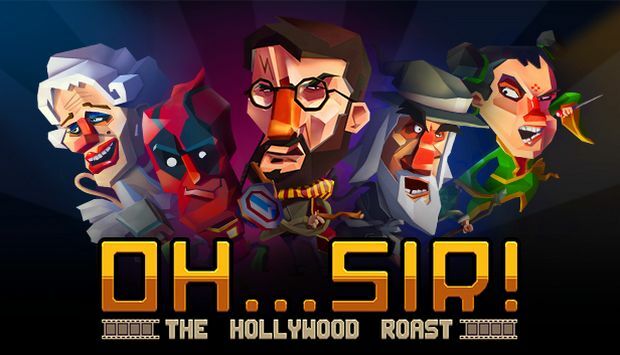 The Hollywood Roast is available on PS4, Xbox One, Nintendo Switch and Mobile.